January 2013 brought record-setting heat to Australia; not just for days, but for weeks. Temperatures regularly eclipsed 45 degrees Celsius (113 degrees Fahrenheit) in multiple locations across the continent. According to the Australian Bureau of Meteorology, Australia set a new record for the highest temperature averaged across the entire nation: 40.33°C (104.59°F) on January 7. The national average reached 40.11°C (104.20°F) the following day. The overnight minimum temperature for January 7–8 also set new a record—32.36°C (90.25°F)—contributing to the hottest two-day period in Australia’s recorded history. Each of the first eight days of 2013 were among the 20 hottest days on record. The scorching weather continued a trend of four consecutive months (September to December 2012) where temperatures were the highest on record. The persistent heat mirrors a similar pattern that developed in the continental United States in 2012. 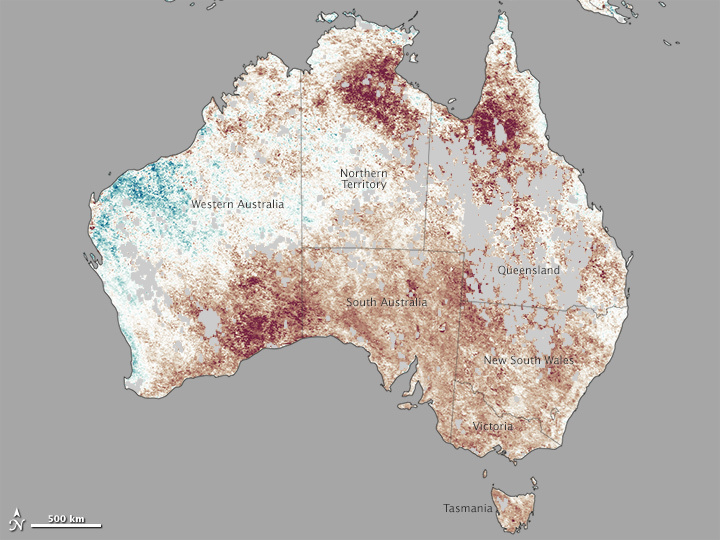 The map above shows land surface temperature (LST) anomalies for Australia from January 1–8, 2013. LST anomalies are not absolute temperatures; instead, they show how much temperatures were above or below the average. 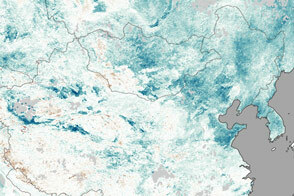 The darkest reds show areas that were as much as 15°C (27°F) above the norm; blues show areas that were below normal; and grays depicts areas with incomplete data (often due to cloud cover). 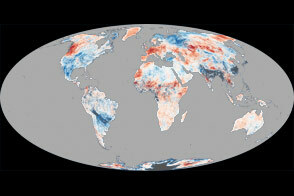 The map was built from data collected by the Moderate Resolution Imaging Spectroradiometer (MODIS) on NASA’s Aqua satellite, and the 2013 data is compared to the average for the same week as observed from 2005–2012. 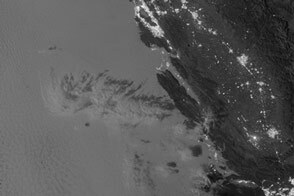 NASA Earth Observatory image by Jesse Allen, using data from the Land Processes Distributed Active Archive Center (LPDAAC). Caption by Michael Carlowicz. Satellite observations of land surface temperatures show a continent broiling under record-setting mid-summer heat. Australian Broadcasting Corporation (2013, January 15) Australian heatwave part of 'unmistakeable' global warming trend: IPCC chair. Accessed January 22, 2013. Australian Bureau of Meteorology (2013, January 14) Special Climate Statement 43 - Extreme January heat. Accessed January 22, 2013. 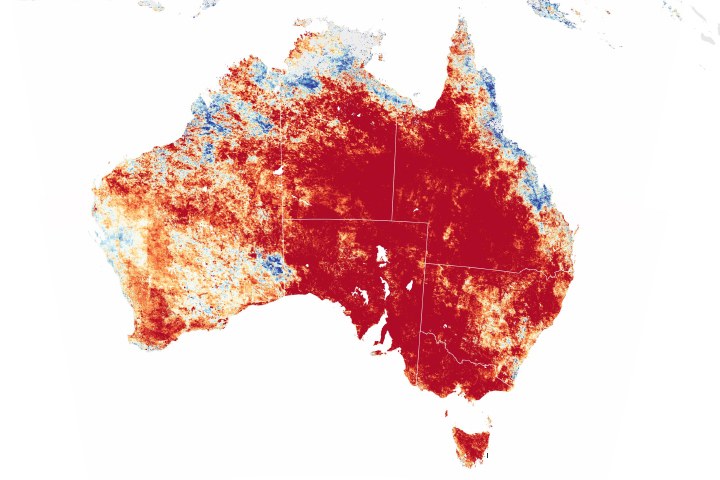 The Conversation (2013, January 18) What’s causing Australia’s heat wave? Accessed January 22, 2013.